Lewis Adams, 33, lives in Etwall, South Derbyshire and is a firefighter with Derbyshire Fire and Rescue Service, having previously worked in sports development and health and fitness. 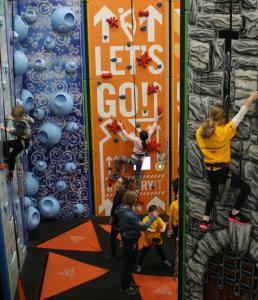 He spends a chunk of his spare time coaching Skyline Junior Climbing Club sessions. "I first got into coaching while I was at secondary school. I did a two week work experience placement with the sports development team (which at that time was one single sports development officer) at South Derbyshire District Council. "I initially began helping out at my school's after-school table tennis club and, after completing my level 2 coaching award, began to take more of a lead coach role in the after-school club." "While working for South Derbyshire District Council, I was fortunate enough to have been given the opportunity to coach in a really wide variety of sports and activities to all ages, from young people to the elderly.
" I have coached table tennis, basketball, football and many other sports and activities to young people in and around South Derbyshire and Sheffield (while at university) on a regular basis. "Following on from university, I worked in the fitness and health industry, working with GP Referral and cardiac rehabilitation patients. I then went travelling for a year and experienced a little of the Australian Sports system. "On returning to the UK I then gained a full time job with SDDC working with older people leading Nordic walking, running, cycling and chair-based exercise groups. Nowadays, I'm focussing on climbing and, as a volunteer, I have been developing some weekly junior climbing sessions with my climbing club, Skyline Mountaineering Club. "I played table tennis to a reasonably high level and took part in many regional and national tournaments as a junior. "Other sports (basketball, athletics, volleyball, cycling) have played a big part in my life as well but have mainly been recreational. 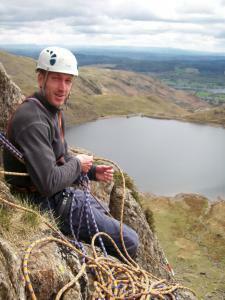 "My main passion now is climbing and mountaineering, which I try to fit around my young family. "Coaching has taught me many things over the years, including the importance of understanding who you are working with and how they learn and receive information. "You are then be able to put it across in a manner that they will understand, and I have been able to develop that through working with all ages and abilities. "I'd also like to think that my patience has also been refined to its fullest!" 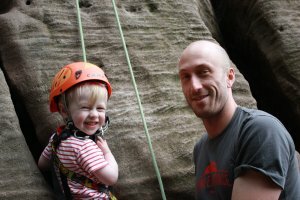 Helping a young person take part in their first outdoor climb. "Recently I met a young person who I introduced to climbing who is now employed at a local climbing wall – and it's a great feeling to know that you have helped shape someone's future. "A good coach will always focus on the athlete, client or person first and know when to offer advice, give encouragement, correct errors or just back-off and leave the person to work the problem out for themselves. "They should also ensure that the athlete gets the best out of themselves; whether that be a personal best performance or simply a smile of satisfaction. "Ultimately, I believe that a good coach should always encourage, motivate and ensure their session is fun, so that the person keeps coming back for more. The Skyline Juniors section is thriving thanks to Lewis' help. "Volunteers and coaches are vitally important, particularly at the grass route level and in local community sports clubs. "Clubs only survive if new blood (i.e participants) continues to filter through and often the first impressions and experiences that newcomers get affects their continued participation, so it's important that the coaches and volunteers make it enjoyable. 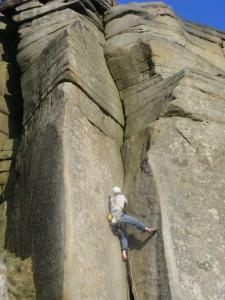 I certainly like to think that my climbing club is a very diverse one and understands that everyone gets different uses out of the club; from hard rock climbing and mountaineering to the more sedate walk to finish in the pub. "My main goal for the future is to build on the success of the recent Skyline Junior Climbing Club sessions and, ultimately, I would love to embed this junior section into our main Skyline Mountaineering Club. "I also hope to build on my climbing qualifications and gain my Mountaineering Instructor Award in the future, where I will be able to instruct people in the higher mountain ranges. It's a real commitment to volunteer so I always respect anyone who does it. It can often be quite a thankless task, but every now and then something happens to make it all worthwhile! "Often the hardest part is setting your foot through the door and once you have started things will quickly fall into place. "Just remember that for the vast majority of the time, the participants want to be there, so all you have to do is pass on your own passion for whatever sport or activity it is and your halfway there already." 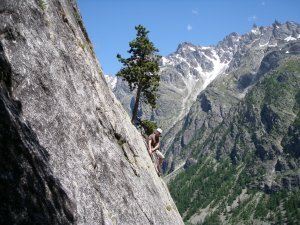 Climbing outdoors brings with it some beautiful scenery.